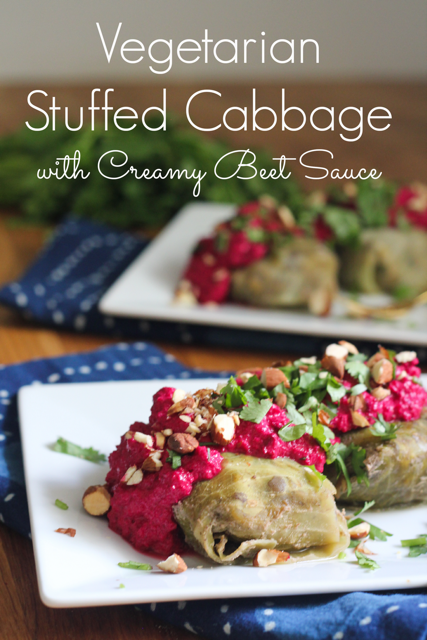 Vegetarian Stuffed Cabbage with a Creamy Beet Sauce! You’re going want to put this sauce on everything. Trust me, I’m a doctor. I mean my Bubbe wants me to date one. Close enough. So I know I say this every week, but last weekend was epic! Maybe it’s because I live in Austin, land of breakfast tacos, Shiner beer and more spontaneous music than an episode of Glee, but it’s all fun all the time. This past few days, for example, I attended a taping of famed Chosen Person Jerry Springer’s new show Baggage On the Road (you read that right. And I can’t share details unfortunately, it’s super classified and I don’t want to go to jail.) 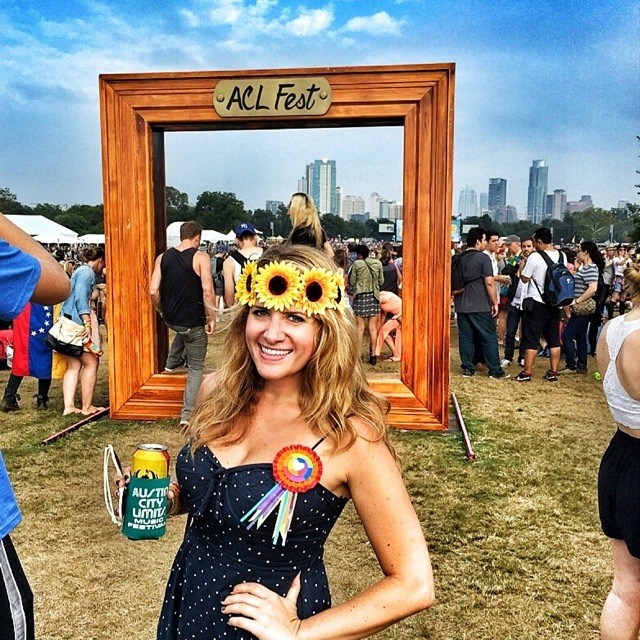 And then I frolicked around ACL, a magical festival fueled by glitter tattoos and vodka adrenaline. This event isn’t classified, but I probably shouldn’t share photos anyway, because Bubbe may be judging. Okay, just one. And speaking of Bubbe, she is coming to visit me next weekend (!!!) SO excited. I’ll make sure to film a new video with her, because it would be selfish to keep her all to myself. 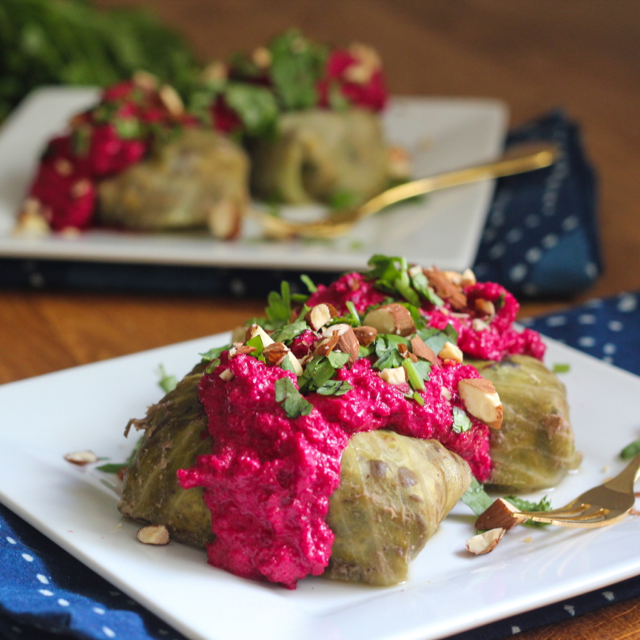 One of Bubbe’s classic dishes is stuffed cabbage. My brother and I would devour the rolls, smothered in a sweet and tangy tomato sauce. 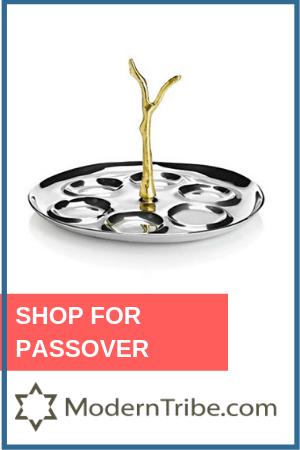 We could even call it Jewish BBQ sauce. Yeehaw! So this version is a twist (because this is how we do!) 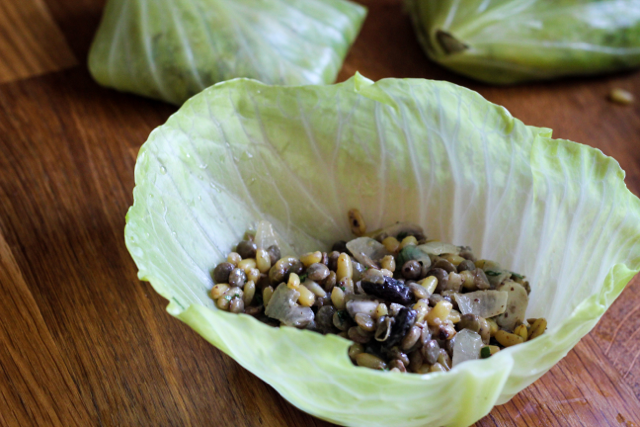 with a nutty tahini laced farro and lentil filling. 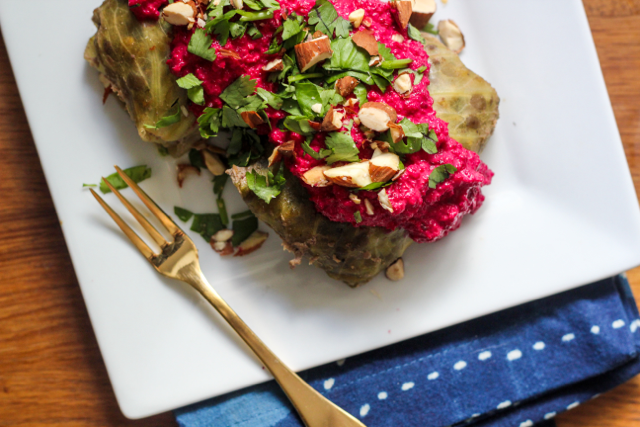 And because stuffed cabbage tends resemble the resulting color if dirt and pickles had a baby, I covered it with a neon pink beet sauce. And crunchy almonds. And fresh cilantro (if you hate cilantro, use parsley, or don’t). First, let’s make the filling. Heat olive oil over medium high in a large sauté pan and add onion. Sauté while stirring until onion starts to soften, about five minutes. 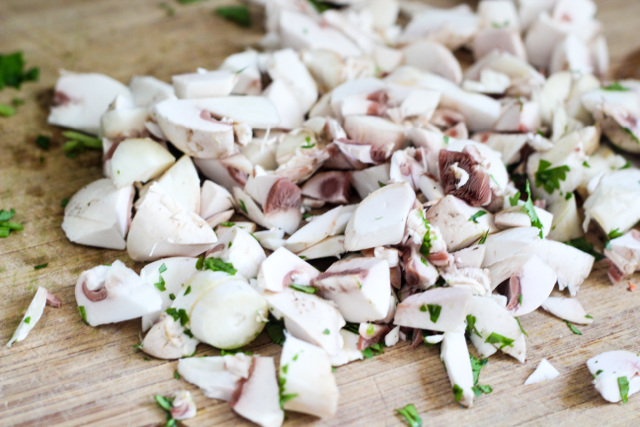 Then add in diced mushrooms and sauté while stirring until mushrooms start to soften, about 2-3 minutes. Lastly (finally!) add minced garlic and sauté while stirring for one more minute. Set aside to cool. 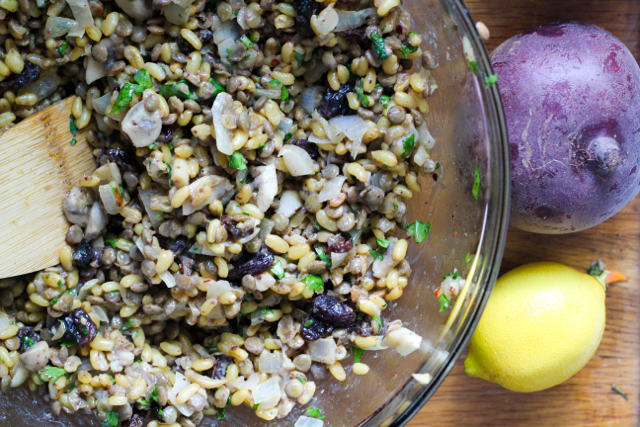 Once cool, combine lentils, farro, mushroom mixture, raisins, tahini, lemon juice, sumac, honey, cilantro, chili pepper flakes and salt to taste. Let’s boil the cabbage! 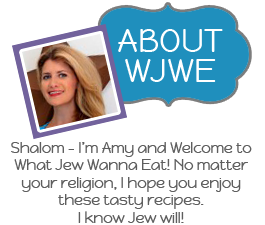 Woo hoo. 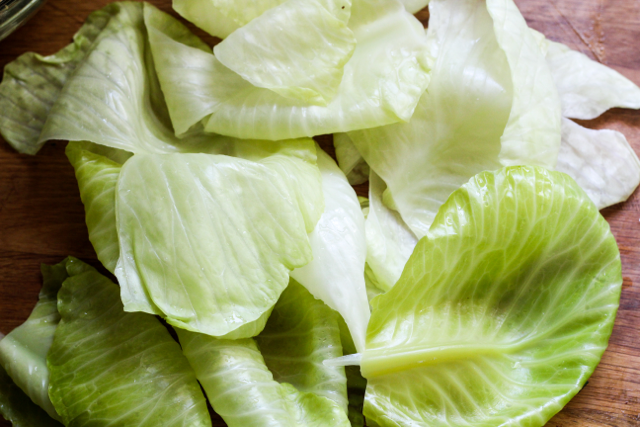 Fill a large stock pot with water and bring to a boil. 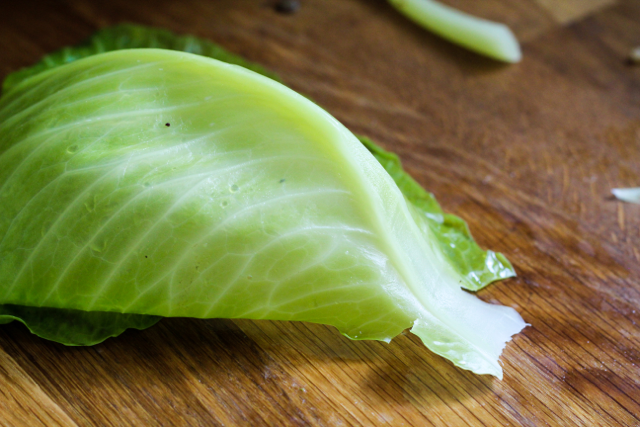 Carefully place cabbage in the water (don’t burn yourself, please!) and boil for a few minutes while rotating every so often until the color changes and the outer leaves start to separate. 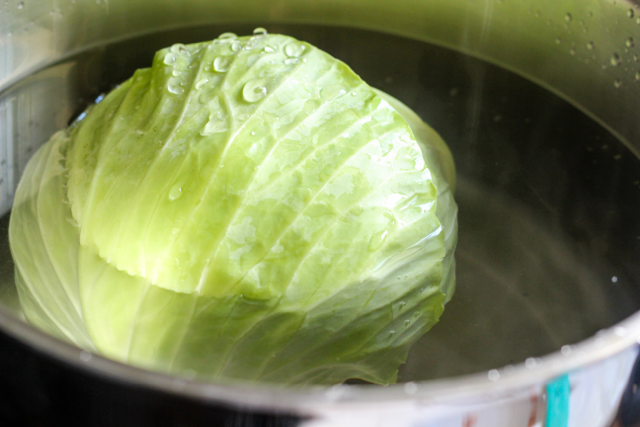 Remove cabbage from water and rinse under cold water to cool. Carefully remove leaves making sure not to tear them. On the end of each leave, you’ll find a thick stem. 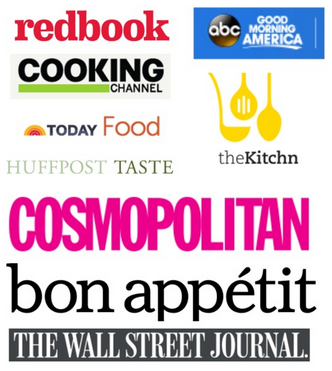 Using a sharp knife, thin down the spine to make it more palatable. Now we roll! Place about 1/2 cup of filling in each leaf towards the spine end. Cute, right? Fold the spine side up, then fold in sides and roll like a little Jewish burrito. Ole! Repeat with other leaves and put in a large Dutch oven spine side down. You may have a little filling leftover. Eat it! It’s okay if they are tight! Cuddling is okay. Pour a 1/2 inch layer of stock on the bottom of the pot and bring to a boil. Lower to a simmer on the lowest setting of your stovetop, and cover. Simmer for 1 hour, checking periodically to make sure there is still some stock in there. Add some stock if needed so rolls don’t burn. Meanwhile, make your sauce! 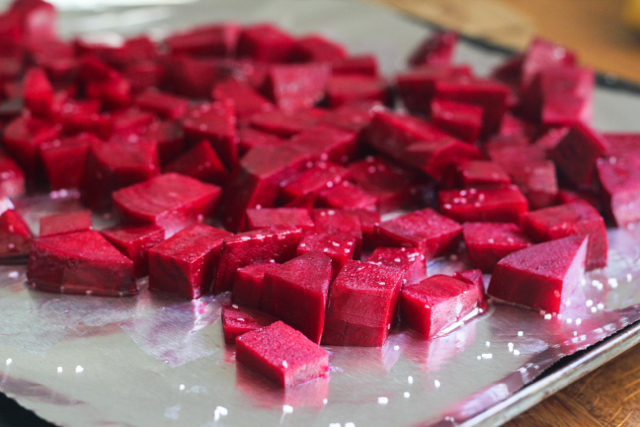 Preheat oven to 400 degrees F. Drizzle diced beets with olive oil, salt and pepper and roast for about 20 minutes. until very tender. 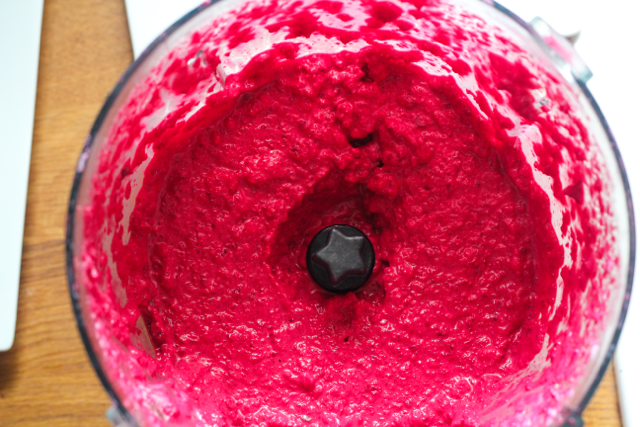 Let beets cool slightly and puree with Greek yogurt, lemon juice, and olive oil. Add water to get desired texture, sauce should be thick enough to coat the back of a spoon. Season with salt and pepper to taste. 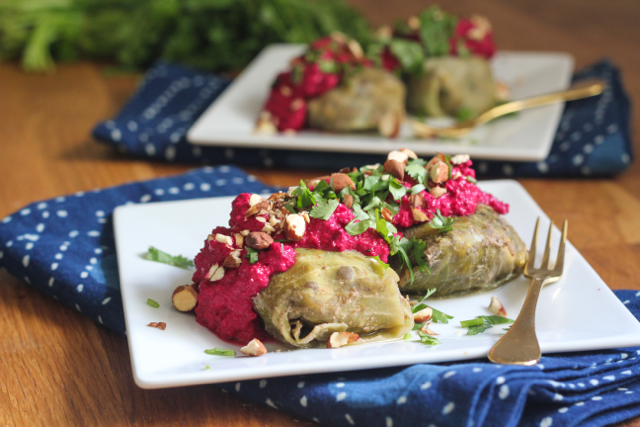 Drizzle sauce over hot cabbage rolls, garnish with almonds and cilantro, and dig in! Now we roll! Place about ½ cup of filling in each leaf towards the spine end. Cute, right? Repeat with other leaves and put in a large Dutch oven spine side down. You may have a little filling leftover. Eat it! It’s okay if they are tight! Cuddling is okay. Pour a ½ inch layer of stock on the bottom of the pot and bring to a boil. Lower to a simmer on the lowest setting of your stovetop, and cover. Simmer for 1 hour, checking periodically to make sure there is still some stock in there. Add some stock if needed so rolls don’t burn. Let beets cool slightly and puree with Greek yogurt, lemon juice, and olive oil. Add water to get desired texture, sauce should be thick enough to coat the back of a spoon and puree. Season with salt and pepper to taste. 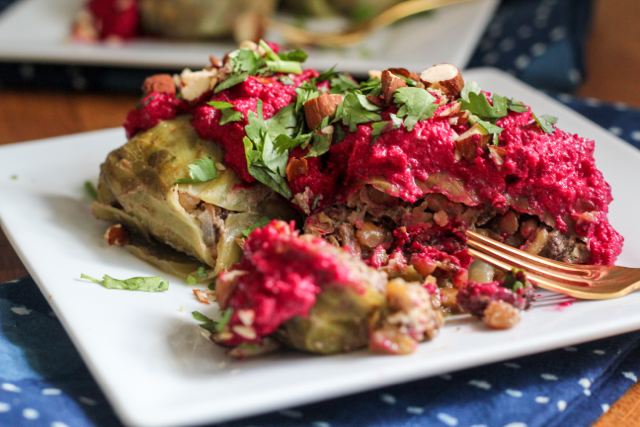 This stuffed cabbage looks divine! 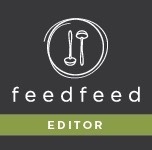 Love the beet sauce! 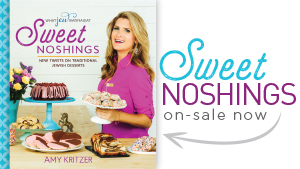 Oh, wow do these look good! 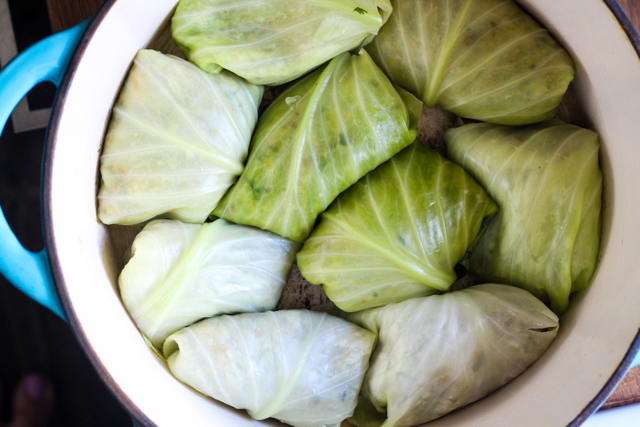 I just made stuffed cabbage rolls last week .Mom said they were just as good as the old Aunts used to make. Woot! That’s a huge compliment. 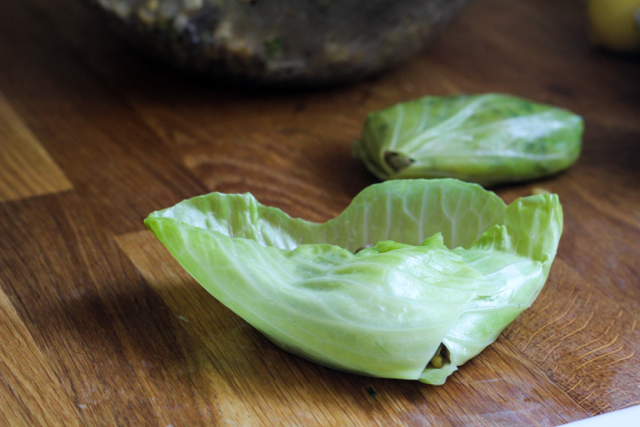 These I think I’d have to make for me and the Kidzilla – can’t get the Hub to eat a beet or cooked cabbage. More for the girls! That beet sauce looks so beautiful! Great pics! This looks scrumptious, and I esp. love the beet sauce!